Ozone is a gas with the chemical formula O3, and is the third most powerful oxidant. Medical ozone is produced by oxygen and its passage through a voltage gradient, using ozone generators that react to dioxygen molecules, forming ozone (O2 + OÆO3). 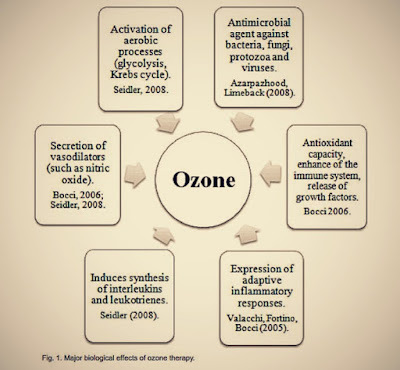 Several biological actions of medical ozone include the increase in the synthesis of biologically active substances such as interleukins, leukotrienes and prostaglandins that are beneficial in the reduction of inflammation and in cicatrization, the activation of aerobic processes (glycolysis, Krebs cycle, beta-oxidation of fatty acids), secretion of vasodilators (e.g. nitric oxide-NO), activation of the mechanism of protein synthesis and increase in the quantity of ribosome and mitochondria in the cells, thus raising the functional and potential activity of tissue regeneration (Seidler et al., 2008). 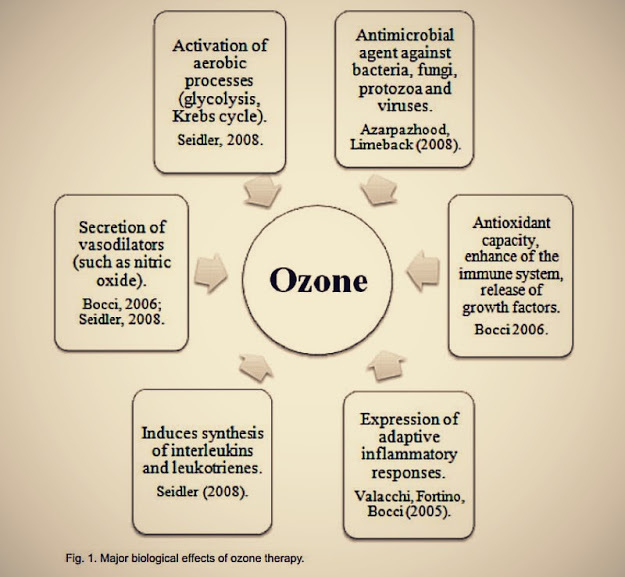 The ozone oxidant potential induces the destruction of cellular walls and cytoplasmatic membranes of bacteria (Thanomsub et al., 2002). The gas was named ozone (a Greek word that means "smell") by the German chemist Christian Frederick Schonbein of the University of Basel in Switzerland 1840.